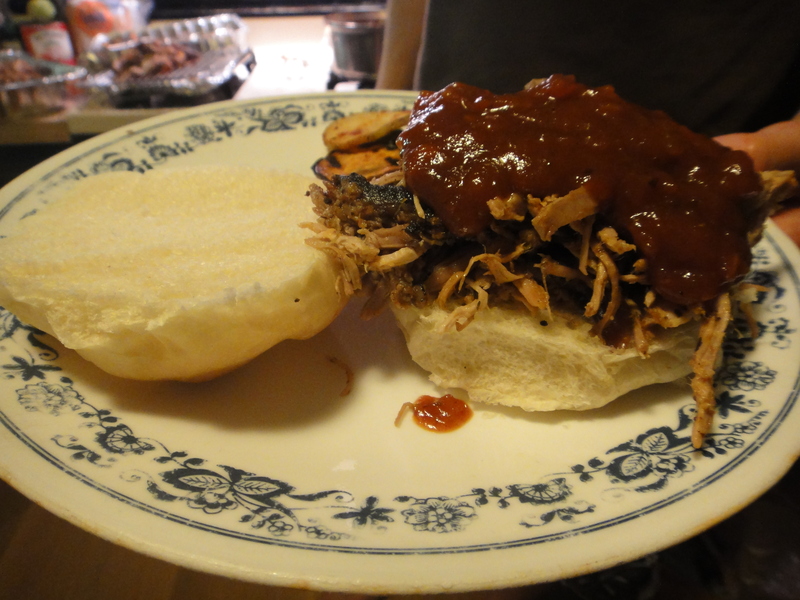 Now for the final installment of the BBQ posts from the 4th of July! Congrats on making it through…may we reward you with some yummy BBQ sauce?!? In a medium saucepan, over medium heat, add the vegetable oil. Saute the onions, garlic, and oregano until translucent, about 4 to 5 minutes. Add the remaining ingredients, ketchup, tomato puree, Worcestershire sauce, honey, brown sugar, hot sauce, paprika, cayenne, cumin, coriander, salt and black pepper. Bring to a boil, stirring occasionally, then lower heat to a simmer and allow to simmer for 1 hour 30 minutes. Taste and adjust seasoning and heat to desired taste. Nice sandwich! That was worth all the effort for sure.